You must send the actual passport. The passport must have at least six (6) months validity remaining before expiration and has at least one complete blank visa page for the visa stamp. NOTE: The last three pages on the passport are not visa pages and are not acceptable. If your passport doesn't meet the requirement, click here to see our passport services. Click here to complete the Vietnam visa application form online. Please note your visa will be valid from proposed date of entry, which you indicate on your application in section 10. You have 15 minutes to complete the application form. 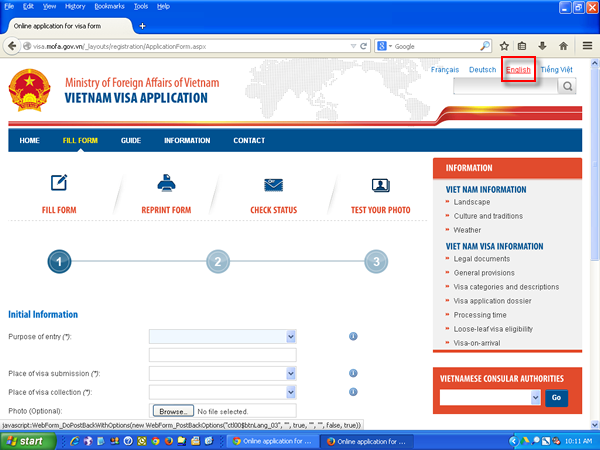 The visa application form is hosted on Vietnamese Foreign Ministry website, it is initially displayed in Vietnamese language. On the top right corner of the screen, you will see the language options, please click on English. Place of visa submission and collection should be Consulate of Vietnam in New York (USA). Click here to completely fill-out order form. You will be asked to input your personal information, order information, and payment information. After inputting your data, click on "Place Order" which will create your completed order form, then print it out and sign it.